Shahrdary Gorgan (Superleague) signed experienced 35-year old ex-international power forward Hamed Sohrabnejad (205-97kg-83). It is actually his comeback to Shahrdari Gorgan as he has played here before. Sohrabnejad played last season at Azad (Superleague). 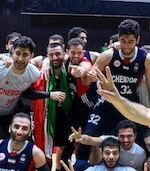 A very impressive season as he was named to Asia-Basket.com All-Iranian Superleague Honorable Mention. The previous (16-17) season he played at Shahrdary Arak where in 30 Superleague games he had 7.0ppg and 4.7rpg. Sohrabnejad helped them to make it to the semifinals. The list of the past achievements is quite long as among others he won Iranian Superleague championship title in 2004, 2009 and 2013. Sohrabnejad was also a member of Iranian international program for some years. He played for Iranian Senior National Team between 2003 and 2014 and previously for University National Team in 2005. Sohrabnejad also represented Iran at the Asian Championships in Manila (Philippines) five years ago. His team won Gold and his stats at that event were 8 games: 4.6ppg, 3.1rpg. Sohrabnejad has spent his entire career in Iran playing for five other teams: Paykan, Saba, Petrochimi, Mahram and Sanaye. It's very possible he may end his playing career at Gorgan.